“Did a little research on this model. 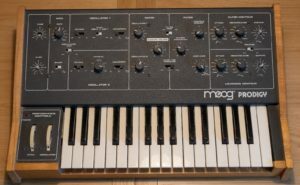 It’s one of their first before the marketing on back of the synthesizer. 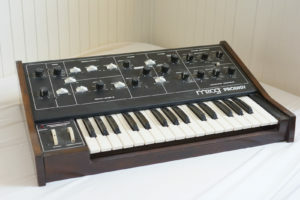 “I regret to separate myself from this Moog Prodigy synthesizer. It is in excellent condition. 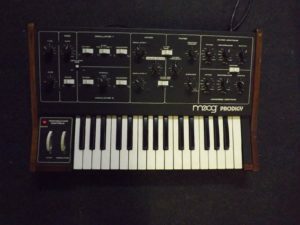 Very simple in appearance, the range of sounds is wide in both for bass and leads. 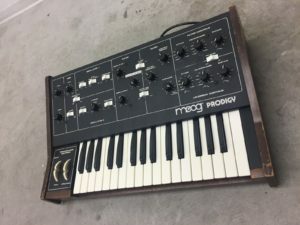 “Moog Prodigy 32-Key Monophonic Analog Synthesizer. Condition is Used and needs work. This is a great vintage keyboard that needs some TLC. How much? I’m not exactly sure and that’s why the offer price is so low. What I do know is that I purchased this item new around 1981. When I was testing it, just prior to listing on eBay, I broke the high F# key. 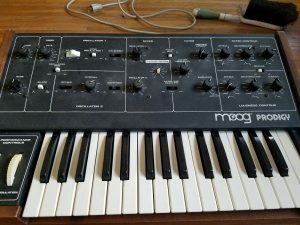 Parts (black key) are available here on eBay for around $15 and YouTube videos are available on how to repair this. A great design and easy to fix. The wheels are a bit discolored due to the playing environment they were exposed to 35 years ago. Of course there are normal wear – nicks and scratches. The only work I’ve performed is cleaning it up a bit and working the pots and switches with Deoxit D5 contact cleaner. It does play, but certainly needs more attention before it is gig worthy. 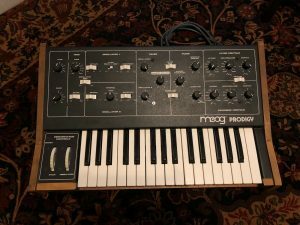 In addition, like many VCO based vintage synths, you must allow it time to warmup before playing. 30 minutes is a good starting point. 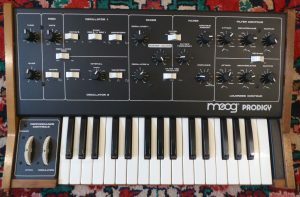 If you start playing before it warms up very disconcerting sounds are heard and the keyboard does not function properly. When it fully warms up it works okay except for the broken issue. ” This thing rips. Love it to pieces. 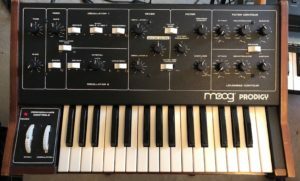 It sounds beefy and has that classic buttery Moog filter to taste. Would not be selling however I need to. I hope it finds a good home as it’s treated me well and I love this thing. 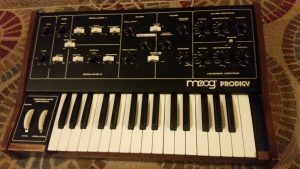 “Overall very good condition. Tested and working having had a full diagnostics run. “Works fine . Pots are clean power supply works perfect. 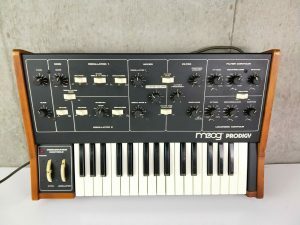 “Der Prodigy wurde vor ein paar Jahren komplett runderneuert. Dementsprechend ist der optische Zustand vergleichsweise sehr gut (siehe Fotos). Auch technisch war bis vor kurzem alles bestens und er hat hervorragend geklungen. Dann hat allerdings die Tastatur Probleme gemacht und kurz danach fiel sie ganz aus. Mehr sollte es nicht sein, allerdings kann ich es auch nicht 100% sicher beurteilen. Jedenfalls wird der Prodigy ausdrücklich als defekt an Bastler abgegeben. Es handelt sich übrigens um das 230V Modell, ein Adapter wird also nicht benötigt. 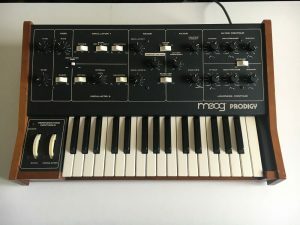 Bei Fragen zum Prodigy gern eine Nachricht schicken! “If you didn’t already read the “Used Condition” status, I will briefly describe this again. 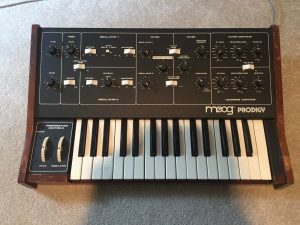 I bought this Moog Prodigy about 4 years ago for about $1,300. At the time it worked okay, and then very quickly starting breaking. 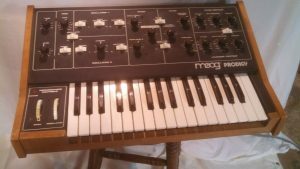 It has had some work done on it, specifically the Oscillator 2 has been fixed and worked on. The first “F” key has been worked on and is now working properly as well. It has been going out of tune immensely and has just now been fixed and tuned back into working order. However, there is now a bit of a problem with the Pitch Bend wheel, where it only sometimes works. 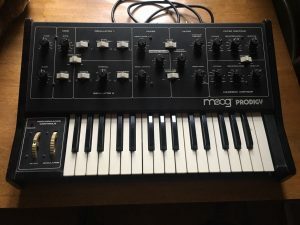 It should be a very simple fix, but at this point, I really cannot afford to put any more money into this thing, as much as I do love playing it. So, again, this is a working item with some repairs, that makes it not 100 percent original (which is hard to tell unless taking the thing apart anyways) and of course that the pitch bend wheel does not work well at all. 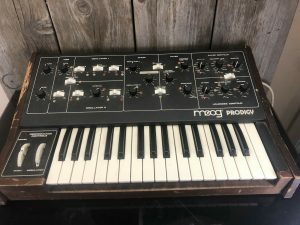 “Vintage Moog Prodigy here in cosmetically reasonable shape. 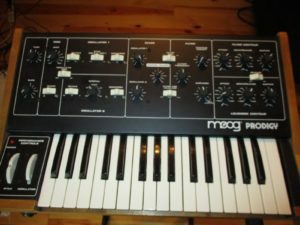 When I bought this a few years ago it had just been serviced by James Walker of Synth Repair Services. 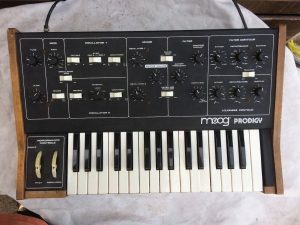 It had also been fitted with a Kenton socket kit on the rear, providing CV, Gate and Filter mono mini-jack inputs – you can run a sequencer through it amongst other things. Normally I wouldn’t approve of tinkering with classic models but in this case it really does add ‘functionality’ + the upgrade is discreet, professionally done and doesn’t destroy the appearance. The keys are slightly discoloured, the woodwork’s a bit worn, scratched & faded, there are a few scratches on the back panel & lettering. The first (last?) key on the right has a couple of small marks, possibly burns from some dope fiend’s smouldering hash dropping onto it. 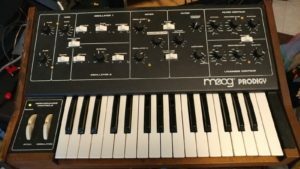 I’ve owned this instrument for almost 20 years now, and it’s still in great shape and sounds fantastic. 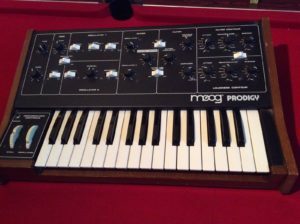 “The Moog Prodigy is a simple yet surprisingly versatile two oscillator analog synthesizer. 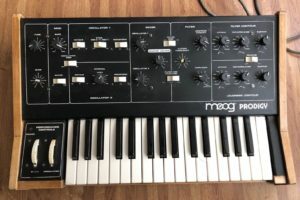 Designed to be easy to use but still sound incredible, this is a perfect synth for beginners and experienced synthesists alike! 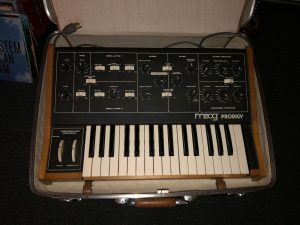 “1979 Moog Prodigy in working condition. Sustain potentiometer stem is broken, but still functions. Everything operates as intended. 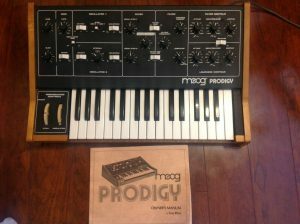 “This Prodigy is in great shape. I know, since I repaired it. The case is original and un-restored. The keyboard is perfect. 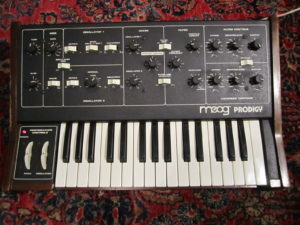 It has all of the knobs, switch covers, and case feet. I did change the LED from Red to Green and added golden screws to make it look sharp. 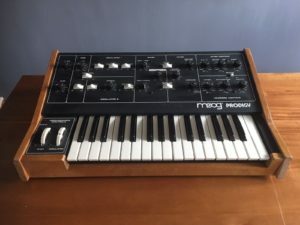 I am selling because I have a couple of other similar synths and this one is just not played enough. So love it well. All it needs to be kept in good shape is tuning. It has ports on the back for that. 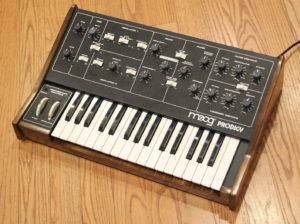 It is a fantastic synth. 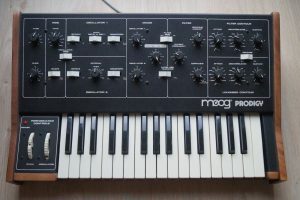 It has TWO oscillators which makes it sound so much richer than other single-oscillator rivals. 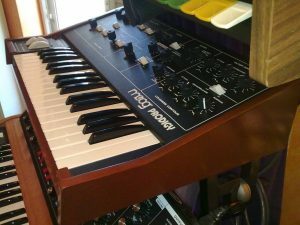 Hard sync between the oscillators, in particular, produces some amazing sounds, especially when used with the unsprung pitch wheel. 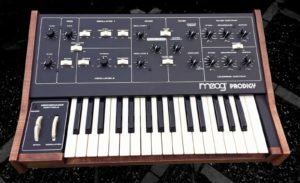 The famous Moog ladder filter sounds just as good as the hype. I played this once at uni and during soundcheck it was very loud in the PA subwoofers. I thought it was going to take the building down! It will seriously blow your mind. It has CV and gate (S-trig) inputs for external control, including control of the filter frequency. 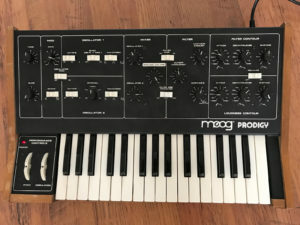 I am also selling a Kenton Pro 2000 MIDI—CV converter which works perfectly with the Moog Prodigy for driving it from a MIDI sequencer, workstation keyboard or DAW software (I used Ableton Live). See my other items. He made everything work right, cleaned up up, cleaned contacts, you name it, he did it. 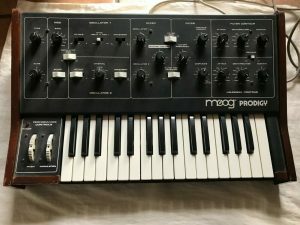 ALL knobs switches, buttons, keys, etc, work fine! No issues. I also refinished the wood cabinet. The two top corners were a little dinged, so I rounded them off before staining. I think the rounding looks good, but it’s different from stock, thus the mention. 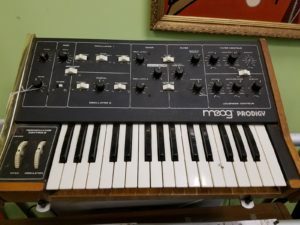 “Moog Prodigy 336A Synthesizer Keyboard/Professionally Inspected & Serviced! 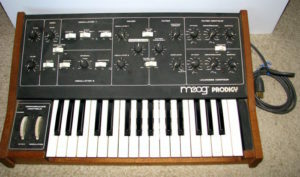 “Classic Moog Prodigy Synth in great condition and full working order, complete with user manual.